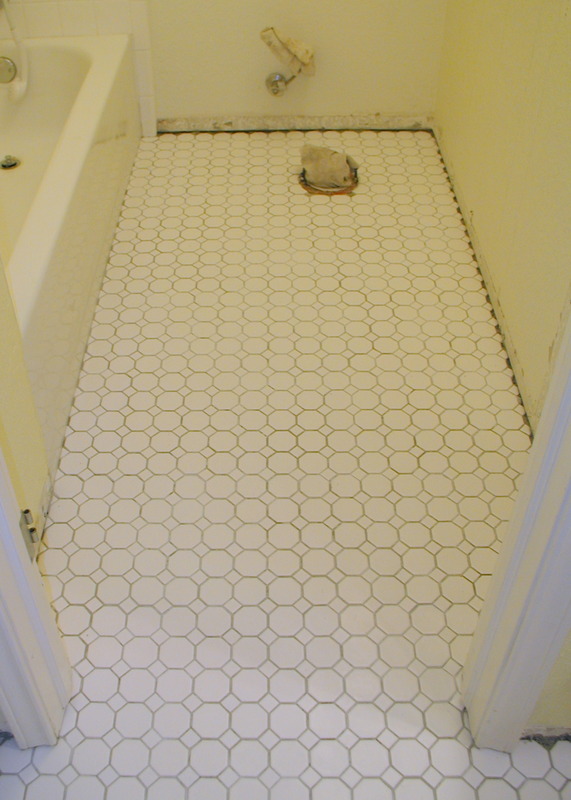 In the end, we decided to go with a small tile pattern on a connected grid 12″ x 12″, instead of the 6″or 12″ tile for the bathroom floor. The first reason was, once the 6″ and the 12″ was laid out on the floor we would have ended up with an odd cut against the wall, no matter how we arranged it. 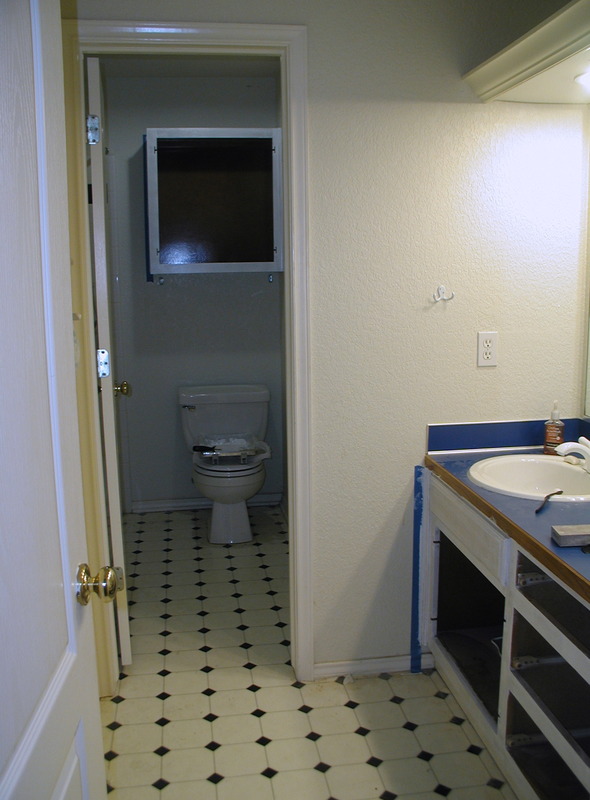 The next reason was this bathroom has two rooms that do not match in size. Putting larger size tile would have made the adjoining rooms look even more lopsided then they do now. It’s a problem also because the toilet is not centered in the bathroom so when you enter the first room and look forward, the toilet is off-centered. BTW toilet location is determined by code as it must be so many inches away from the wall and so many inches away from the tub (as determined by your city). Because we are changing the floor, I always like to paint before the new floor goes in so I don’t have to worry about paint splatters and drop clothes. I paint the ceiling first, then walls and cabinery. Any electrical work (such as adding the side sconce in the toilet area) should be done before painting and tiling. It’s best to completely remove vinyl before proceeding; we used a mat and putty knife to remove it. If you have a lot of layers or old fashioned linoleum, they do sell a floor scraper for removal; it has a broom handle and a blade scraper on the end. The tiles are mixed thoroughly between boxing. Mixing the tile ensures, if color is different between batches, it won’t be noticeable once the floor is laid. The same (mixing wood from all boxes) should be done if you are laying wood floor. Dry lay just means we are setting out the pattern without afixing it. Take your time here and make sure you get the layout you want. It’s also the time to make guide line marks in pencil or with a chalk line. This helps keep the tile line straight when being laid. 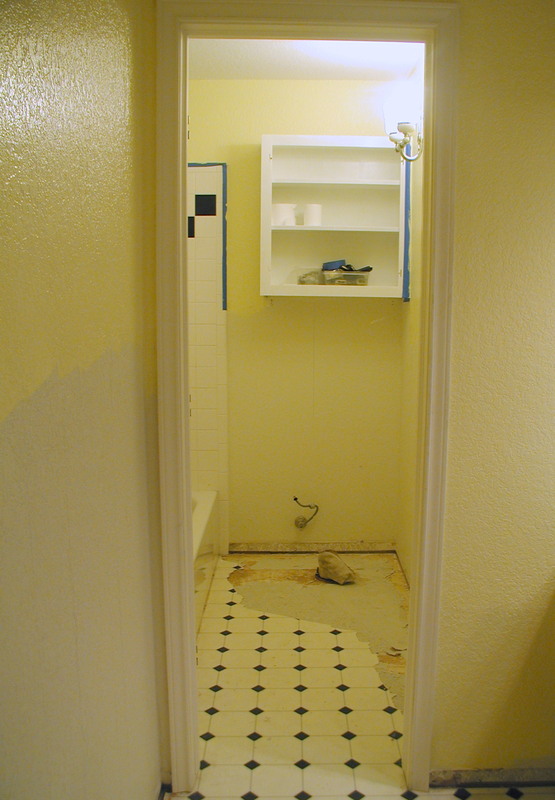 For this project, laying the tile started from the back wall, behind the toilet. But it needs to be measured and aligned from the front entry door so the tile appears straight when entering the bathroom. When going through a doorway pay particular attention that tile is straight both horizontally and vertically. Because these tiles are attached to each other on a 12″ x 12″ sheet they are easier to lay and keep straight then free, individual tiles. Most houses don’t have perfectly straight corners. For this reason, dry lay and keep adjusting and make marks where you visually want the tile to lay. For example, we wanted the doorway to be the straight line but that meant it was a bit off from the tub (on the left) so the line was slightly adjusted to appease both area. TIP! ~ make sure you measure by the true width of YOUR tile. Our so-called 12″ inch, square sheets actually measure at 11 3/4″. Door way jambs have to be trimmed to fit the new height of the floor. Professionals recommend mixing your own custom Thinset so you can increase the latex and thus the flexbility of the floor (for example if you decide to lay over plywood which can be dicey), but we couldn’t find those materials easily so went with a pre-mixed Thinset by Mapei which had added latex. Follow your package instructions on making your Thinset and make only as much as what you can do within the drying time the product gives. Make too much and you won’t get it down before it dries. Our floor (about 50 sq. feet) used the entire 50# bag for Thinset and Grout. 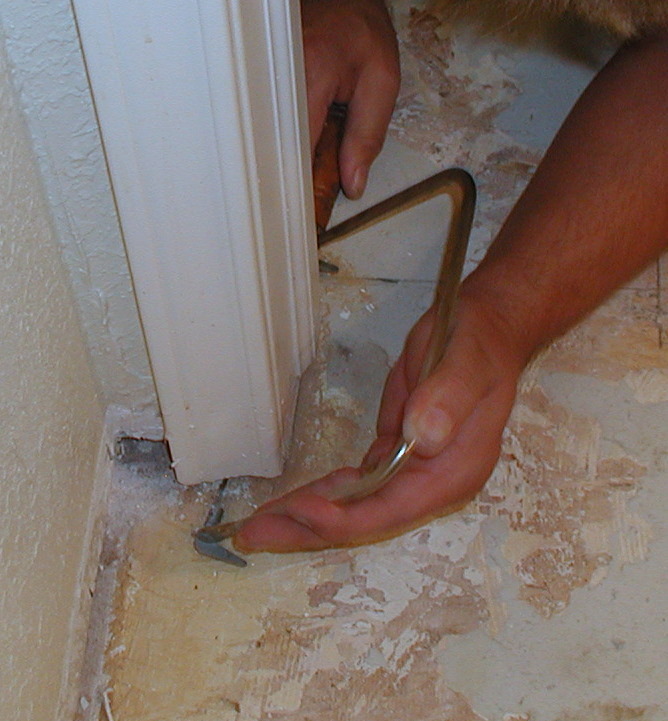 Thinset is applied using a grooved trowel (link shows trowel sizes due to tile size; also check the Thinset bag directions; the type of flooring subsurface can effect groove size too). Too little and it won’t adhere – you want an even coat throughout. Too thick results in bumpy tile. It’s not as hard as it sounds – it’s like frosting a cake! Because we used a smaller tile, we were able to use a hand tool (nippers) for trimming tile for toilet and wall edges (wear protective eyewear when cutting tile!). 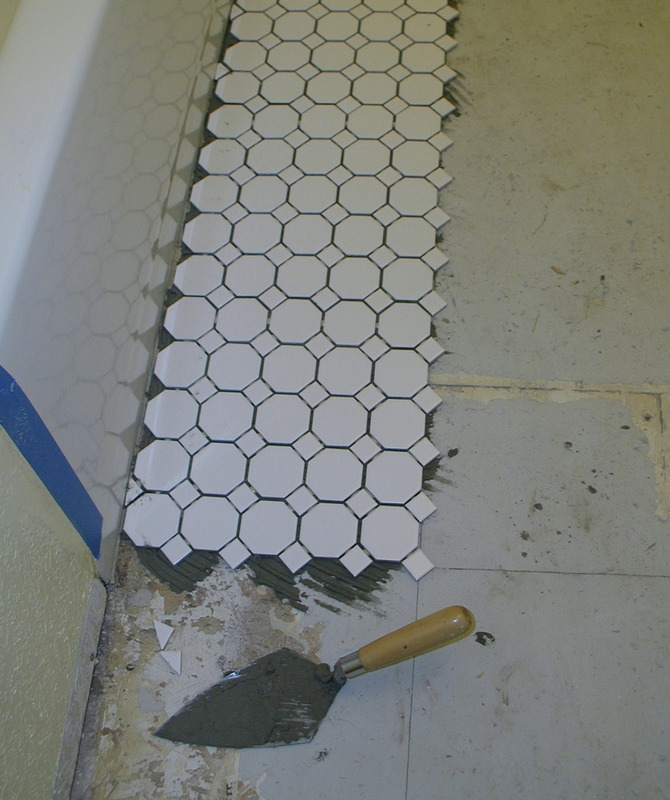 For larger tiles (6″ or 12″) use a wet tile saw. The tile is left to dry 12-24 hours (read your Thinset directions) before grouting. Grout is applied with a tile float at a 60 degree angle. Excess grout is then removed with a slightly damp sponge. Have some buckets on hand to rinse and clean the sponge as you work through the project. After grouting, we left the project to dry for 5 days and then I applied a protective topcoat. Without it, your grout will become dirty and change color over time. original toilet light is on in this photo! Before the new toilet goes in, we are putting up Board and Batten halfway up the walls with new baseboard and trim. Tiling isn’t out of your reach but it does take some research and planning beforehand to have a great end product. Great website with lots of information and tips on tiling! Definitely do some research about your specific floor and what would work best – especially if you have an older home. Size of your tile, the surface you are laying on, and type of tile (i.e. popular glass tiles take a special Thinset) effects the choices for trowels (i.e. size of teeth) and grout. Depending on how bad the subsurface is you may even have to replace it or smooth it beforehand to get the best end result! It’s wise to invest in some knee pads if you plan on doing any tile job. They really REALLY help! Choose tiles for floors that are labeled FLOORS! Some tiles are only graded for use on walls. If tiling a kitchen or bath, make sure your tile is rated for slippery, wet areas. You may be better off going with a rougher, surfaced tile in a bath area if you think the bathroom users may need extra security under their feet when stepping out of the tub or shower. Smaller tile with more grout lines also gives additional foot security. If cutting 6″ or 12″ tile, use a wet tile saw – NOT the small cutting machines sold at home improvement stores. A wet tile saw can be rented from tool rental companies and is well worth the investment. The cuts go faster and are very professional in appearance. If you have used a regular saw of any type they are not difficult to learn how to use (wear protective eye gear when cutting tile!). For your first project, try to use a tile that is mounted on mesh backing or attaches a group of tiles onto one sheet (our used glue dots). It provides a straighter line, goes down faster and is easier for beginners to work with as opposed to individual 6″ or 12″ tiles. 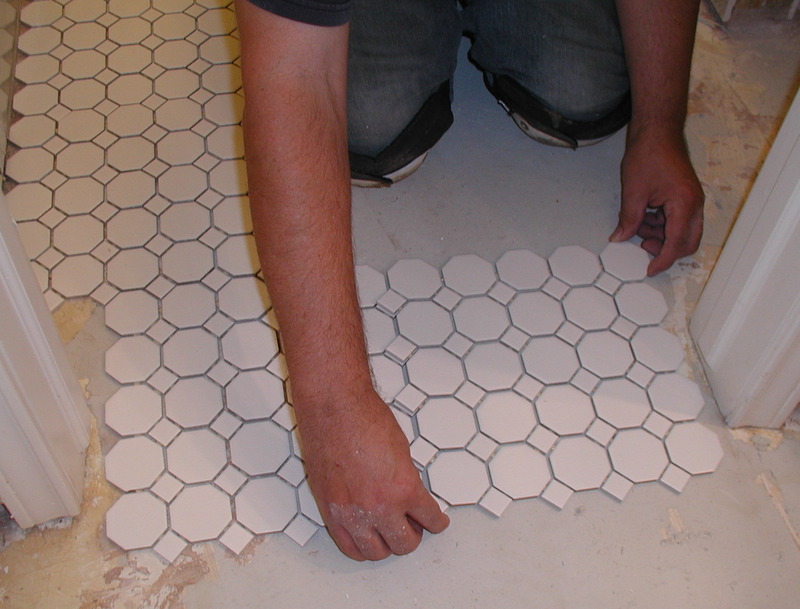 It will also not require spacers since the distance between tiles is set by the mesh backing or glue dots. 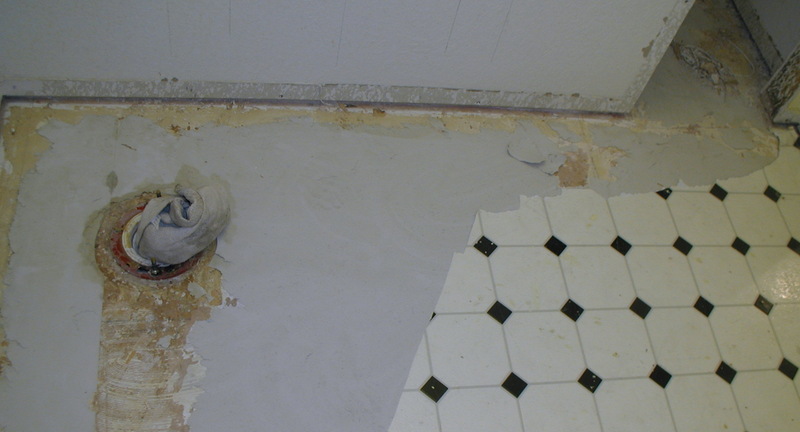 Laying tile on the diagonal can be tricky. Wait until you are more experienced before attempting it. This also seems to be going out of fashion right now. 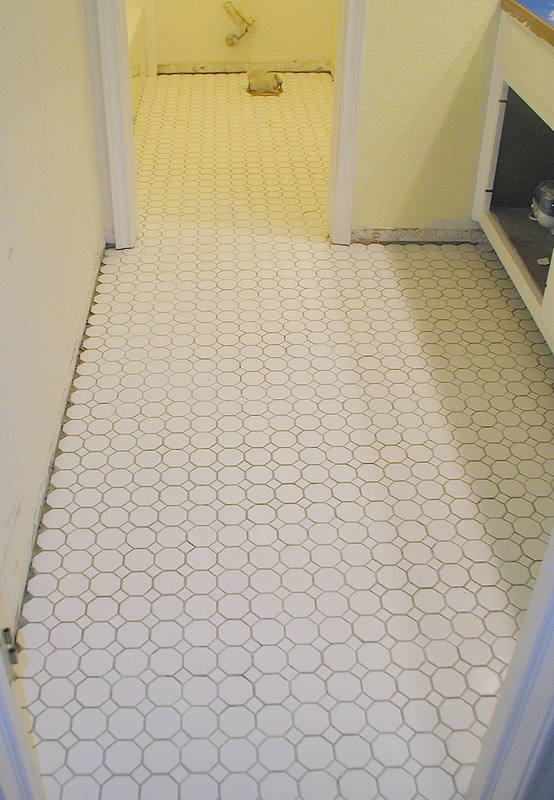 Spend time dry laying your tile and experimenting with how it will cross the floor and where the cuts will be. 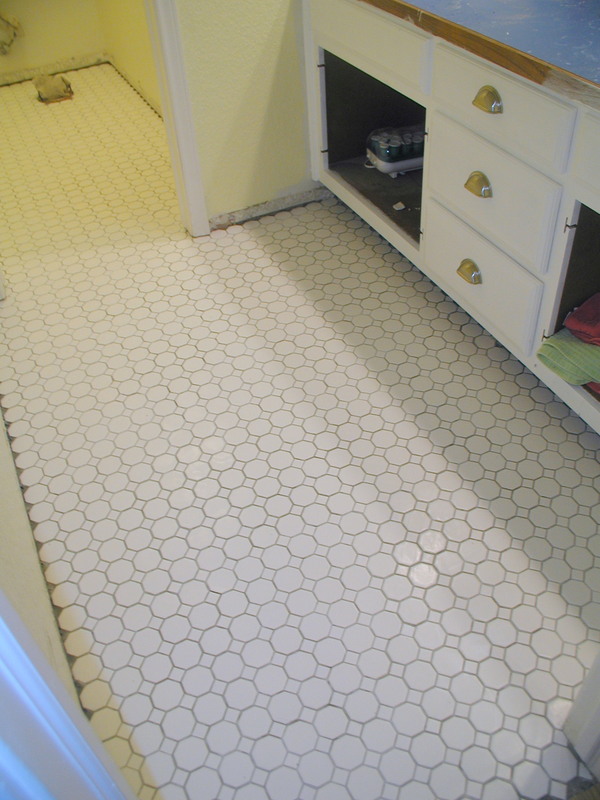 When we did this project, the smaller tile was definitely more attractive in the cut placements then 6″ or 12″ tile. tip: selling your house? visit open houses! 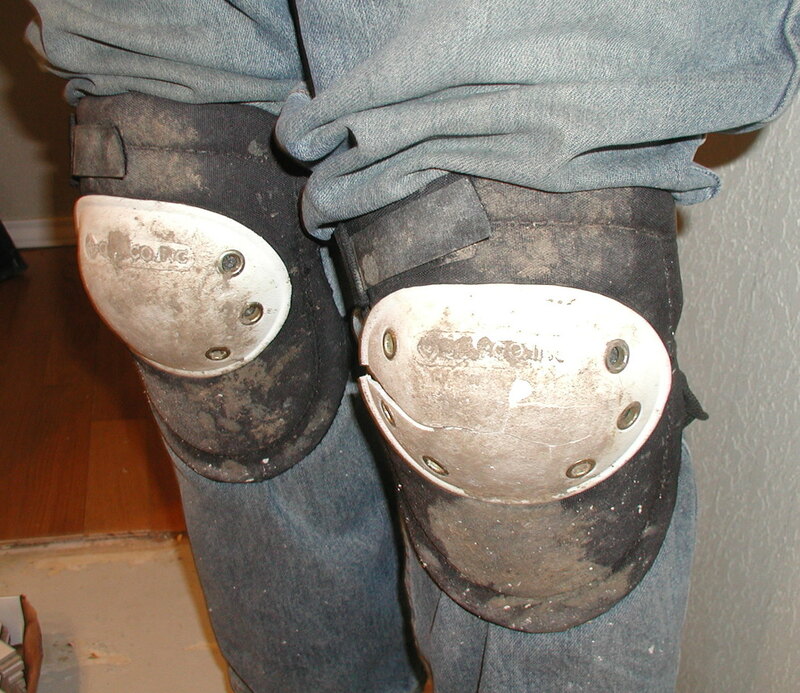 Those knee pads are definitely useful especially when you’re about to undergo a major renovation project like installing tile floors for your home. The last picture shows the fruit of your labor of love and I must say that it looks great! Thank you! You can find kneeling pads for gardners and in a pinch use a Yoga mat!